Google AdSense is the most money making word where number of bloggers are waited to get approved by this. Most of the people making money with the help of Google AdSense. Google AdSense is a free program run by Google. It provide an ads structure to your blog or site, via which your readers click on them and you earned money. Google AdSense is the easiest way to make money. Also it is the to monetize your blog. Here are some awesome tips and tricks to increase your Google adsense earnings. Yo have to set the formats of your ads.It is upto the mark Proper size and length of you ads raise your earning standards. Do not put too many ads on your blog, because it will create complexity and looks cheep. Put only those ads who is relevant to your post. Do not just paste number of ads, mark only relevant ads. Don't click on your ads, otherwise Google will punish you and ban your site. Use the “heat map” provided by Google to analyze other top performing ad placement slots. 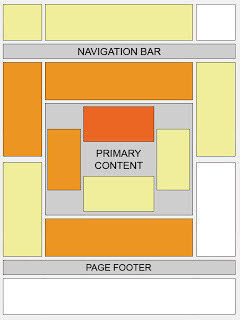 You should also concentrate on the areas with darker orange color which represents the hot spots of the ads slots. Always try to use your ads in color combination because it looks good and moreover people get to know that this blogger have an good designing sense. Make sure that the border colors, the background colors, link colors and the text colors all match your site. As i always said that content is the king of your whole post, so try to be little more attractive, creative and unique. Don't just paste and paste the content, try to add some salt in your post. Collect some useful information and than with your skills amend your post. As we say honesty is the best policy but sometimes money can change our mind. So if you are in blogging field than you have to control yourself. People generally do they click on their own ads to earn money or they forced their friends, family to click on their ads, but my friends this is illegal. Don't do this because Google have an eye on your blog/site. Don’t ask others to click on your ads.